A few days ago mom happened to tell me that it was easy to speak about the Maarjaara tatva or complete surrender to God, but difficult to actually follow it. Similarly I have often - for lack of a better word - romanticized the concept of detached attachment. To be there in situations but not get attached or affected by people and circumstances. Many a time, life presents us queer circumstances which we may encounter for the first time, where so many aspects of our character are tested. Patience, response to stress/pressure, emotional reactions - the decision of guarding them or not, so on and so forth. I remember a dialogue from a film that 'response under pressure is the best judge of character'. Though I don't think there is a one-size-fits-all sort of a advice, I don't know why this line usually comes to my mind when faced with, say, what I think may be a tough situation. And again how 'tough' a situation is also subjective. People react to instances based on their own life experiences, their past, based on accounts from others in their family or their circle of reference. Should we judge someone or something based on trace elements of similarity with an encounter or an experience in the past? Perhaps not. A point in time like this may be where we listen to a higher force, intuition, or the inner voice; some of us may resort to prayer, some others may just know the right thing to do and they may do it easily. However, what I am learning, with each passing day, is that people will do a lot of things. It might be an unthinking, flippant act, or premeditated. One may react or feel a myriad emotions even or just a couple of significant ones. Blood may rush to the head and we may be able to hear only that noise loudly in our ears. And perhaps one of the ways of redressal is to spend time with oneself and accept what we are for who we are first. Identify our own failings, our responses under pressure and try not to be acidic in self criticism and forgive ourselves first. Thereafter one may reconsider and revisit decisions. And I definitely believe if one can be honest to oneself first and never compromise on knowing the truth about oneself things could be easier. A journey called a lifetime. Several paths, crossroads, dead ends and intersections, highways and flyovers, speed limits and speed breakers. And choices. The learned know what lies in the end. And they say that we know about the things that were truly worth it, only in the end. If only we could have the wisdom early on, things'd be simpler. However, maintaining a graceful bearing, poise and dignity is paramount to me and my upbringing. This article caught my eye because a friend tweeted it about this yesterday. Last year, when I was going through a social media issue, two people with active Facebook accounts also joined in with wild accusations. One was a cartoonist and another, a guy who called himself an 'investigative journalist', Anbalagan Veerappan. At that time, his profile claimed that he had worked with Sify. It also claimed that he was a real estate agent. Amongst a lot of things, this guy said he taps into people's phones because it is investigative journalism. Now he has the wherewithal or the authority to tap into phones, (he also said he was tapping my phone and my mom's), is a big question. I, of course, did mention this later to the authorities and we had given screenshots of these threats, to back our complaint. Friends also joined in, some of whom had also worked with Sify, to report his Facebook Page and it was deactivated. Now it is interesting that this guy's FB post of SB being bought over got noticed by a Bangalore based techie, Suseendran, as reported here by ET and journalists and finally led to an IT department raid. I am not really a person for conspiracy theories, but if a man like Anbalagan claims to tap people's phones and spread wild rumors which actually do have an repercussion, I am wondering if there are a group of people who randomly write random stories like this. I am wondering where this leaves us and our personal responsibility before tweeting a news story. Are we now in an age where people crave to be famous/important for a few seconds by breaking news? Even if it is false? It seems like it. Even in my case, last year, it was a bizarre rumor one guy tweeted, to attract attention, which a cartoonist working with a 'respectable' publication shared without verifying. Clearly, as some informed people watching social media behavior say, it is the age of the "creepy Indian male social media celebrity". I am quoting an informed friend "Freedom of expression in an immature society makes for a disruptive combination"
I cannot begin to wonder at all the people who said it was 'wrong' to go the authorities. I am quite sure, this post is like a literal bait for the same trolls all over again. IMO there is more to these tweeters and social media "rowdies" (as they want to proudly call themselves) than meets the eye. Eventually time will tell. Another way of looking at this could be that there are some people who seem to like the influence, perhaps, or the power, (of sorts) that the few hours of attention that their blogs/FB Pages/Tweets get and take things too far. A case in point is also people who rush to tweet that a celebrity has passed away, when they are still in hospital. I know of several celebrities who have been given RIP messages on twitter when they had completely recovered and were on their way back home. Sooner or later there will be laws that will be introduced, modified to suit new menaces such as these. Bottom line - do not trust a social media post blindly. Always verify, double-check. Especially when it involves people, their families and their livelihoods. The past several days mom and I have been hearing various anecdotes related to weddings and rituals and customs and practices. One of the strangest accounts our therapist told us, where her son-in-law belonging to a smaller town down south had an interesting demand. It was the first Deepavali after the daughter had been married. Hence they had gone for the customary visit and to deliver gifts that are expected of their family. On the day of Deepavali they offered oil for the traditional oil bath in a bronze bowl to the son-in-law and he would just give the bowl a look at it and refuse to take it from them, without giving any reason. "Etti etti paathutte irundhaaru... enna nne sollala she said". The lady then felt something must be wrong and by the time they got it out of him that the oil must be offered to him (as was the custom in their town/family) in a silver bowl, which must contain sesame oil and a gold ring of a certain weight, it was late afternoon. Being Deepavali, they had to go and ask a jeweler to open the store, buy these in a hurry and give it to him. “Andha aattam poattaaru avaru” she said. She somehow has a very hilarious way of narrating such stories that most of her listeners would be laughing. What struck me most is (opinion based on personal accounts I have heard) that a lot of people in the lower economic strata have unfair demands on a girl’s family. As a society with its various rungs, don’t we all by default know how much another family of our own strata would be able to afford? With a wedding, a girls’ family falls into debt, (not from banks mind you, coz banks won't fund them) but with the usual kandhu vaddi, meter vaddi kinda lenders. Small wonder Indians would rather not have girl children, because the society punishes a family that has a girl child. I tweeted about this yesterday and got a few responses on the affluent and the dowry system prevalent there specifically naming some social groups in India. My tweet was more in the lines of people who can ill-afford expenses. A marriage, for me, is only a social custom that recognizes a man and a woman as a couple so that may now legitimately procreate. A social custom 'sanctified' according to various beliefs. Various customs and practices have been introduced in society and as it changed some more introduced/eschewed tailoring them to the cultural or societal needs at a given point in time. Culture/Society is one of the most dynamic aspects IMO, constantly evolving. Nothing is, or can be written in stone. Sati was an accepted and endorsed social custom. The women of a land considered it better to die than be ill-treated by the enemy. How that went on to become an aberration until social activists changed the face of it, we studied in school, albeit briefly. At some point women were educated too. I am yet to understand when people started saying women no longer need education. However, I presume the upper echelons of most world societies continued to educate their women to a certain extent. Somehow this concept of dowry baffles me. How a lot of groups in India believe that, the sole qualification of being a man or having a male child is enough to keep demanding one thing after another of the girl’s family when it comes to marriage. Unless the mindsets change, no law or lawmaker can do much, I guess. One of the best songs that happened this year is the single with Shekhar sir that will release tomorrow, October 11. #Butterfly or Sitakokachiluka has lyrics by Rakendu Mouli. Shekhar sir has been making singles for charity for the past couple of years, namely Saazni featuring Bela Shinde and Saavli, featuring Sunidhi Chauhan, both of which are in Marathi. Sometime earlier this year he happened to mention that he would like to make a single in Tamil/Telugu and he sent me the tune of the song he has in mind. We got the lyrics written and recorded the song in August in Mumbai. Shekhar sir spent a lot of time on his diction and wanted to make sure that his pronunciation was perfect. It was heartwarming that a composer like himself was taking so much effort to sing in languages he doesn't know and I was humbled when he asked me to sing in the song with him. 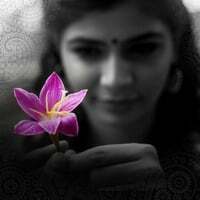 Sitakokachiluka talks about love that comes in silently, beautifully and unexpectedly as the butterfly that flies in through a window that someone forgot to close. As with Saazni and Saavli, the proceeds from the legal downloads of Sitakokachiluka will go to Ma Niketan, a home that takes care of abandoned or uncared for girl children in Thane, a charity that Shekhar sir has been supporting. The Press conference for Sitakokachiluka is scheduled to happen at Radisson Blu tomorrow. The song and the preview will be available on http://www.shekharravjiani.com/ from tomorrow. The Joy of Giving week is happening between October 2-8 and several organizations and individuals are pitching in to do their bit to promote philanthropy, charity and the concept of giving. My very dear friend, Meera Sridharan, an extremely talented and dynamic person, has been volunteering for Joy of Giving week and she put together a press conference (with other volunteers too, of course. I am mentioning her here as I know only her personally) and asked me to participate, along with other panelists, including Mrs Rekha of Downs Syndrome Federation of India, Courtyard Marriott, Chennai Runners, Mr Mahadevan, Euro Kids, United Way and Aram Seiyya Virumbu. By helping an organization that I trust, by doing what I do best, I am doing my bit for Joy of Giving week. #JoyOfGiving Singles will be available in all major publishing and streaming ecosystems all over the world. I will update the links here very soon. For your part, I urge you, to do your bit, whatever it may be and do something special for someone, anyone for Joy of Giving week. And perhaps soon enough, we'll all promote a healthy, happy community and an environment that the children of tomorrow can be proud of. Let us remind ourselves that we have not inherited this land /resources from our parents but we have only borrowed them from our children. Let's leave this place better than how we found it. We can, can't we? Sometimes they say that sighting a butterfly is an omen. To me the butterfly came in a song. First week of November 2012 and I got a call from Shekhar sir asking me to come and sing for him here, in Chennai. Off I went to Gopi Sunder's studio seriously doubting how I will be able to pull this off, when, that week, and the couple of weeks prior, it was a personally harrowing time. I recorded this song with a migraine that was killing me and somehow I hoped that I didn't look too sick and that I would come across as an affable person to work with, inspite of the frowns crinkling my forehead. Shekhar sir dictated the lyrics and taught me the song. I went in and recorded and it was done. Thereafter of course, I had no idea if my version would be retained and left it to the will of the universe, as I always have, with every song that I have sung. As Yesudas sir once said, slightly modifying the popular adage, Gaane gaane ke upar gaanewale ka naam likha hai. The song chooses the singer. When they released the teaser on last week, there was a mixture of a lot of emotions. Of gratitude mainly and relief. At that point, somehow I got so emotional that I bawled. Called up a dear friend (or perhaps she called, I cannot remember now) who was also bawling on the other side and said she was so happy for me. And she said that this is for all that Ma has done for you. And we bawled some more. Amma wasn't too expressive to me, but she tweeted. 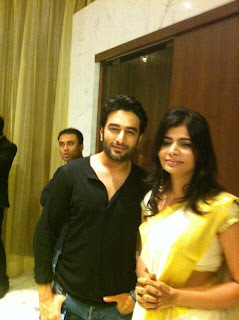 Shekhar sir invited me to the audio launch on the 3rd July and I landed up. I felt lost initially, though I have attended numerous ones here. Thankfully spotted Jitesh (Pillai) and I heaved a sigh of relief that I finally saw someone I knew. 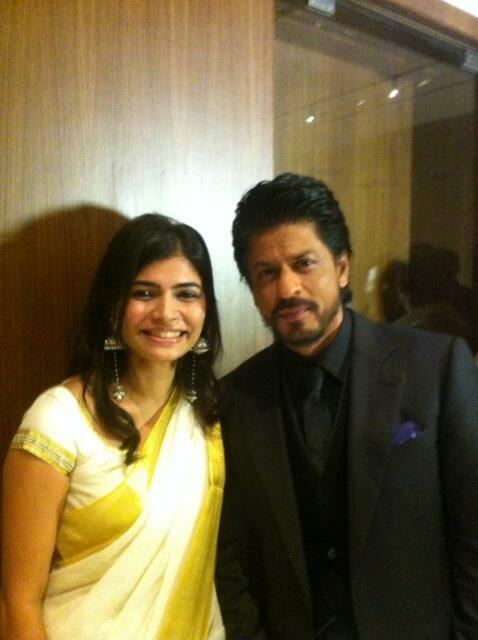 Shekhar sir introduced me to SRK and I, for one of the first times, asked him for a picture. He obliged and said he was touched by my mother's tweet and asked me to convey his regards to her. Though the word "mindblown" is soo easily thrown about these days, that's exactly what I felt at that point. One that he read my mom's tweet, two he remembered and three he enquired about her. I said I am humbled and cannot imagine that a superstar of his stature would do all that. Deepika was extremely sweet and told me that she loves Titli and yes she obliged with a picture too. Post event party, SRK said said he'd like to talk to my mother and I thought it would be one of those polite conversations and I said sure whenever you want. And he said I'd like to talk to her now. Call her. And I did. He took my phone, went off someplace quieter where he could have a conversation for a few minutes and returned. I kept telling Shekhar sir (Vishal wasn't present at the launch and I hadn't been able to meet him during the recording session here in Chennai) how grateful I am for the opportunity of a lifetime. Sometimes, life gives us gifts. Like the rainbow after a storm. Or like the rain itself through thunder and lightning. And because life is the way it is, the gift is carried by someone. This time round God was kind enough to send it through this song. To be able to continue doing what I like doing best, which is singing and to be able to meet some of the most creative, brilliant minds and musicians is the greatest gift that has been accorded to me. And I believe that each song that comes my way is a blessing. And it is impossible to not feel immense gratitude for the people who make it possible. This time it is for Shekhar sir (and Vishal sir as well). None of the good reviews or the interactions with SRK / Deepika would have been possible but for him. And of course to the creator. Grateful. And a lot more. But nothing less. For I am but a paper boat. and I begin writing. With a quill. My fingers and nails stained in cobalt blue. A blue that has bled deep into my fingertips. My fingers move, forming shapes and curves, dots and dashes...forming words. Guided by a force called the heart... perhaps. Once in a while the quill stops. To dip in and write again. And then, there is a blotch of blue. A blotch that spreads into several pores of the paper, washing over a word or two on separate lines. The blotch seems to make a couple of lines meaningless. Or perhaps, they didn't have much meaning earlier either. But I followed the dictates of my heart. My fingers wrote on, guided for what seemed like an eternity. On and on I write, I believe. In my mind I had written reams, while, in reality, I had barely filled a solitary sheet. I dip the quill again. This time the pot of ink spills over. On all the words I had written. The paper is soaked. Little by little do I see my words and the intervals of ivory turning into a brilliant cobalt blue.. I watch, while the ink carries my words along, dripping on to the hard stone floor. A short journey that was, from paper to the floor. My words now rest in peace. So many of them. Or maybe, not so many. Completely contained in a few drops of cobalt blue, as they were before. More so now. And like a scar will the stain remain, containing and reminding me of words that once were, neatly arranged, on a piece of paper. 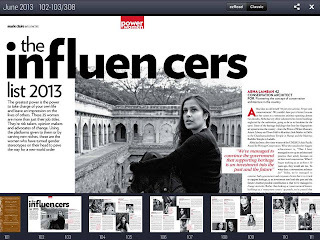 I have been featured in the list as one among 25 women from all over India. 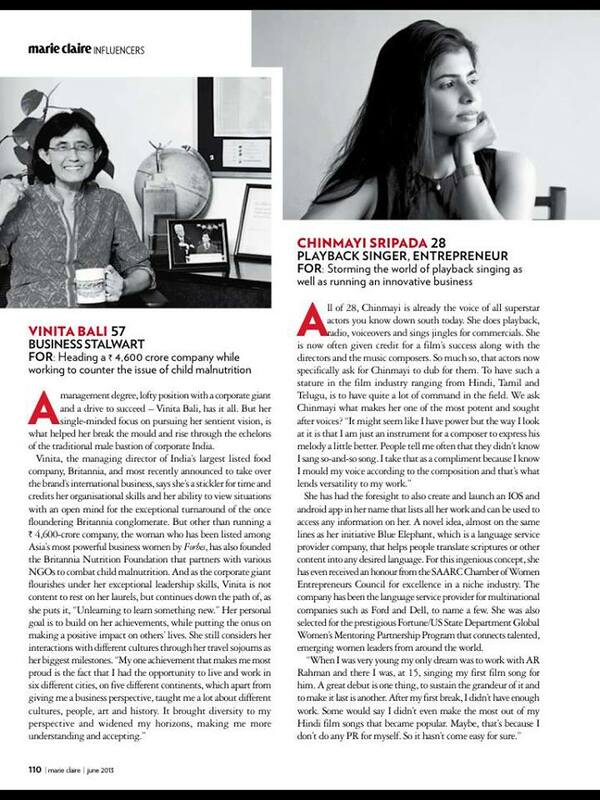 The women featured in this list are terrific achievers and I now have a few more women to look up to after this article.